Ignoring the moral gray area of taking too much of a free thing, there are some financial consequences that are entirely outside of what we, Mrs. Done by Forty and I, will ever pay for. Assuming that we use and take an above-average amount of free bathroom supplies (and we do), then that cost is going to be (mostly) passed on to other people. Even if a small share of our overconsumption is figured into our bill, we are certainly pushing more of that cost onto other customers than we are bearing ourselves. And when we consider the environmental costs of our overconsumption, we're pushing those long term costs onto future generations. Sorry, future grandkids: that's a problem you get to deal with. Have fun with that. When we create a cost that other people end up paying for, we're coming into contact with an externality: a cost or benefit that affects a third party who didn't have a choice in the matter. These sort of externalities are all over the place. When my neighbor buys a brand new Hummer and puts 25,000 miles on it every year, the entire state gets to share in the environmental impacts, even though they aren't factored into the already huge price tag. When my cousin eats two Big Macs a day for a decade, we all end up paying for the health impacts when he claims bankruptcy after his triple bypass surgery. Markets are not perfectly efficient, which is another way of saying there's more to our purchases than the dollars and cents we pay a vendor. There are often other costs, which the individual buyer and seller don't ever see themselves. But if we accept the premise that humans are inherently selfish, and are rarely that conscious of their purchasing behavior anyway, it's unrealistic for us to expect consumers to consider or act upon externalities. If some schmucks down the street or decades in the future are going to deal with the environmental impacts of my consumerism, then that's their problem, right? In our own push towards financial independence, my wife and I typically only focus on the costs and benefits that find their way into our budget. When I talk about frugality, I care about reducing my costs...not necessarily the costs to anyone else. The same thinking applies to the income side. We invest in index funds, without really considering what impact our dollars might have in those hundreds and thousands of companies we're giving money to. I am primarily concerned with creating a good asset allocation and the return on our investment. I don't give much thought to the fact that funding certain companies likely has negative impacts on other people, which aren't perfectly factored into the stock price. So when I saw this Adbusters poll about the worst corporations in the world the other day, I realized, whoops, I fund most of those corporations. Buying the S&P500 means that I buy that whole index, not just the companies I think have a net positive impact on the world. So I invest in polluters, and companies that make products that harm people, and those that make their customers less healthy. We profit from this investment and, even in a worst case scenario, we will see only a tiny fraction of the real costs. In the grand scheme of things, should I care? *Photo is from miss pupik at Flickr Creative Commons. Deep, DBF. My wife and I ponder this frequently. It hurts my brain. I don't think caring is the issue. It's caring enough to take action. There has to be a tipping point. I do care, at least a little, that my investments technically fund war, and pollution, and a number of other injustices. Do I care enough to invest only in things I feel are great? No. I've also come to terms with the fact that there is no way to logic/rationalize/compromise out of it either. Our frugality often honestly comes from a place of care for the environment. We want to consume less water, coal, etc. However, even if we feel this act "offsets" our investing in Monsanto, or the myriad other companies big and small destroying the environment, it probably doesn't. I'm pretty liberal, but not liberal/bleeding heart enough to change my investments because of that. At the end of the day, I try to remember that this conversation is ridiculous anyways because of how grotesquely privileged I am. If we're having this conversation, why not say, "Why are you investing at all? You clearly have more than you need, so why aren't you giving every penny you don't need to the poor, the mistreated, the marginalized, etc?" The guilt can be overwhelming if you have a conscience. We have to draw the line somewhere. We can each only do so much. Is that a cop out? To some extent, sure, but I'll sleep better at night. I don't think you should give a crap about taking some extra shampoo. Just try not to think about all the children dying in 3rd world countries when you use it. You bring up a good point with the idea of giving every bit of our surplus to those in need. While someone might make that argument, it points out that you can take that conscious spending idea to the extreme. There's got to be a 'good enough' point, while still trying to acknowledge the hidden costs in our choices. Whoa. Powerful stuff, man. I think you just had me reconsider index funds when I get enough saved up to open my Roth IRA. It would be better for me financially, but I may be too much of a bleeding heart to stomach all this. And please care. Those are my kiddos those "costs" are getting passed on to. We should all care a lot more. Right! To a certain degree, I think what I want to take from this is that I ought to care a bit more about the consequences of my investments. Yes on the brain hurt! I don't take all the shampoo, but I take any packages that I have opened, as well any extra soap, because I'm cheap like that. (I know, I know, it just leads to an increased room rate!) The bottom line is that there is no perfect job, perfect boyfriend, or perfect investment, so do the best that you can. Well put, Annie. Perfectionism is a losing game. It's so hard to find where to even draw the line of caring - it can only go so far really. You'll never know exactly how most companies are getting things done and, honestly, seems like the most lucrative companies are the shadiest. I do actually try to factor in what I know about the... moral?... side of a company when buying stock... on the flip side, I feel like "sin stock" is an excellent investment, and if people want to kill themselves, I see little reason to not make a profit off of it. Perhaps this is because I also take as much shampoo and hotel freebies as I possibly can. It's good to know we're not the only ones taking them, BrokeGirl Rich! You're spot on with some of the sin stocks. Some of the best run companies in the world make products that hurt us. Wow DB40, you really got me thinking long and hard this morning on this. I think you really just need to be firmly grounded with your own values. You can’t solve all of the world’s problems, you can’t help every charity, and it’s hard to avoid having some negative impact on the world, the environment, your fellow citizens or future generations. All you can do is work hard to determine what’s important to you, factoring in all the potential impacts you possibly can, and go ahead and confidently live your life the best way you can. I like to think that most of us have some values and goals that add value to the world in some way, and make it a better place. It could be anything from a blog, a friendship, a smile or a revolutionary new product or idea that changes the world. Whatever it is, hopefully some of that good offsets some of the bad we might inadvertently do. That's definitely a positive outlook, Jason, and therefore a healthy one. Since we can't be perfect, it's best to just do our best. I feel, for whatever reason, that I'm a bit too pragmatic and not yet concerned 'enough' about these sort of issues. I'm kind of myopically focused on the ROI right now, as I'm pushing towards FI...maybe that will change later? I love taking stuff from hotels. Oh! Don't let me near an unattended hotel cart or you don't know what I will take. Sometimes I take too much and end up with 10 bottles (no joke) of orange juice that I got from the breakfast bar and end up having to throw most of it out. We definitely took more than our fair share from the Sheraton Club, too, Debt & the Girl. We love us some free juice! I take the stuff if they're useful, or if it's a nicer brand (some Japanese hotels had Shiseido stuff! ), but I won't take it unless I know I'm going to use it... otherwise, I just end up tossing them. That's a very thought-provoking question about index funds - I'm guilty of this, as well, so I'm going to have to mull this over. I guess I can justify it with an 'everyone does it' approach, but that seems like a cop out. There's a bit of the tragedy of the commons in this question, too. (Maybe a subject for another post?) But like you said, we kind of all participate in these externalities, because we can't really force the external cost into the price of whatever we buy. If we wanted to go the route of regulation, we could potentially tax harmful products so that the individual consumer paid (more of) the 'true cost'. I've asked the housekeeping staff at a hotel what they think of people who take the shampoos etc. They indicated they expect guests to take the shampoo, soap and other items that are to be used by the guest. They do not expect anyone to take pillows, sheets, or towels. This really bummed me because I have stayed at one hotel several times and the pillows there were absolutely awesome. It's almost a self-fulfilling prophecy when it comes to "passing on the costs." For example, let's say that companies factor in the 3% (or whatever it is) charge that they get when someone uses a credit card. If you don't use a credit card and get some of the money back in rewards, you probably should start. Anyway great post and I love reading about economics. That's a fantastic example, DC. Rewards credit cards, with their higher merchant fees, are a clever example of an externality. The costs get baked into the prices of all goods, and those without access to credit don't reap the credit card rewards. Thoughtful post as always! I have never really thought about passing the cost on and the impact my monetary actions might have on others. I don't usually take anything from hotels, but I don't stay anywhere fancy. I think everyone needs to decide what they are comfortable with and where they stand. If we cared about what every single person around us did, all the time, it would be too overwhelming! If it really bothers someone that they're potentially funding companies that have different morals than they do, they should take a stand. Thanks, EM. It really is a personal choice. But it might be a more entertaining academic question than one we can put into action. Like you said, it can get pretty overwhelming to think about the myriad impacts our decisions have. Just when I think I'm starting to control my own little world, you throw this at me. Sheeesh... Bottom line, it's hard to put caring into action with complex situations like this. It feels like you're chasing your tail... if you had one. 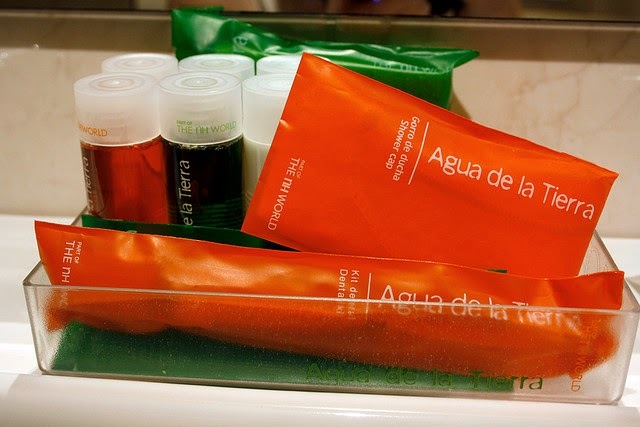 I quit taking shampoo and soaps from hotels a year ago. Went cold turkey. It was hard. How'd I do it? I stopped traveling. Much better to keep temptation out of reach. Chasing your tail is a good way to put it, debt debs. Sometimes this worrying doesn't do us much good. Ha! Yes, at least we didn't break into the supply room. That seems to be the general consensus in the comments here: do your best, but realize it's not going to be perfect. It's a healthy perspective, because we can drive ourselves a bit mad when we think of how short we fall sometimes. Ha! If I can make people feel guilty, then mission accomplished. Tough question. The issue I have with socially conscious investing (and this is horrible)....the returns just aren't there. Sadly, it's profitable to be greedy. I'm not sure I'm ready to take lower returns (and hurt my diversification) just so I can say I invest in good companies only. In the grand scheme of things it's a every man for himself world. Until you get to that certain point where the money doesn't matter. I think that's when taking soaps or investing in a pollution/non-eco friendly company starts to bother you a little. Defintly something to think about for me, I'm not at this point, saving the world is great, but I'd rather do it when I don't care about money. I defer a lot of my 'do-gooding' until later, too. I might pick teaching back up again in early retirement, volunteer more, and we might even give more later, too. Yep, active investing is a no-no for us. We're big believers in the index approach -- we just have some misgivings about the little externalities. I wouldn't sweat the hotel shampoo and soap dilemma. Small potatoes. I can't really wrap my head around what I'm investing in and the ethics of it. I know I'm inadvertently supporting stuff I don't believe in. But it's hard to avoid in a complex society. Here's one way to look at it -- like Robin Hood. Sure, that index fund may be invested in Monsanto, but someday you can use your gains to do some good. Good point, and a tough question to answer. How do you evaluate your net impact if your gains might be from somewhat questionable sources, but you do some good with that profit? I used to take those hotel soaps, too! But I also noticed that I never use them anyways, so I stopped. Good on you, Lisa. I at least feel good knowing they're being used by Mrs. Done by Forty. You always ask such good questions! I think I have become more conscious of this as I get older. It's suddenly not just about me anymore. So on the level of the hotel stuff, I use it if I need it but don't take extra, but as far as investments, that has been a bit out of sight, out of mind, but perhaps it's something I need to look into more. Thanks, Tonya! I do think we end up caring more about the really important stuff as we get older, and find it easier to avoid temptations. Have you ever researched to find if there are funds that index the more ethical S&P companies? Sounds like a good subject for an article. Good idea, Chattanoooga Cheapster. I'll dig into that. Though I wonder if it's technically possible to "index" ethical companies, because the decision of whether a company is ethical or not is, by definition, something that has to be done by a human...leading us into the realm of active investing. I have thought about these issues in the past, of not funding heavy polluters, tobacco companies, and others that are not necessarily good socially conscious companies. But then I look at the returns of the socially conscious indexes and see that they are pretty poor. So the choice is to invest in the socially conscious indexes and probably not meet my retirement goals, or just invest in the total stock market and ignore my social objections to some of the companies in the index. I choose to do the latter, so that I earn the total market share, but then I protest the not socially conscious companies by avoiding their products. I'm in the same boat at the moment, Bryce. I'll try to impact the market with my choices in products I buy, rather than the investments I buy. I won't shop at Walmart for this reason, but the fact is, so many of the major corporations cut costs for consumers while adding costs to the environment or it's employees or society. If I take my business away from all the major brands, how much will it cost me? I try to find a balance as best as I can. ps. Watch the documentary "We're Not Broke" if you haven't already. Thanks for the recommendation, Stefanie! I boycotted Walmart for over a decade, but then when I blew a tire in the middle of nowhere AZ on a Sunday, and all the chains were closed....Walmart's Auto Center saved my bacon. Interesting you see it as free soap and shampoo. Hotels are companies and companies pass on their costs to their customers. You are already paying for these soaps and shampoos. Also you aren't passing on the cost to someone else. You paid $100 a night. Another person pays $100 a night for a room 1 week after you leave. If everyone is paying the same rate then who is paying for whose services and supplies? Nobody gets a refund for unused soaps and shampoos. Now there can be debates of consumption and creation of waste products on a moralistic level that I am in agreement with here. I'm just saying that you have already paid for those items so it isnt passing on a cost and hurting others. I don't agree with your analysis. Costs can't always be perfectly anticipated by a business. If customers in 2014 increase their consumption dramatically, when compared to past customers, then FUTURE customers will bear those additional costs in increased prices. Even if customers collectively pay for their collective consumption, light users end up subsidizing the costs of excessive users. That all goes to say that people who over-consume on "free" items (note the quotes) disproportionately pass on those costs to other people. You're arguing for a perfectly efficient market, wherein every customer perfectly is charged for his or her consumption. I'm not arguing for a perfectly efficient market. A hotel doesn't have to guess who will or won't use shampoo and adjust their costs as they go and leave it up to chance. Its calculated in. Everyone is charged for a bottle of shampoo if they use it or not. The heavy users are paying for their costs in that the nightly rent covers their costs. The light users are giving extra profit to a company. Meh, whatever. I don't see the point in further debating a nit. The hotel soap example is just a lead in to the idea that there are sometimes externalities in the things we buy. If you don't like that example, there are others to pick from. Such thoughtful responses to a weighty question. My husband and I are at opposite ends of the spectrum in this realm, so I am frequently aware of it. We also recently spend 8 days in a hotel. I would feel a bit guilty about purposefully squirreling away toiletries (but moreso I would ask if it's really worth it to have to deal with all those tiny bottles? I mean V05 is like $0.75?). The other Capito is wired differently. We picked up some bottles of our favorite rum at the Costco and my hubby wrapped them in a hotel towel to keep them safe in our luggage. I undermined his convenient thievery by paying $12 for a roll of bubble wrap and secretly re-wrapping the bottles before we left. It's all about what matters to you. Karma can be rewarding, or depriving. As for the investing point... this is something that I'm starting to struggle with myself. When we had a pension information session at work, one of the more (uh, how do I say this nicely) granola young professors asked if there were more ethical options. And basically the presenter said that you're stuck with GICs and money market within their scheme because then it moves into more active-investing, which costs more and isn't part of the plan. I don't think owning a company's stock as part of an index fund is really the same as outwardly supporting them, but it does make that contradiction that is sometimes hard to reconcile. You sound just like me... it's not really stealing. The hotels provide these amenities for your use and they know people take these items home. I just came back from Japan and have bags full of shampoo, soaps, razors, combs and maybe 20 pairs of slippers. Call me cheap but when a hotel offers you some premium soaps etc, I take them and for weeks and months after my trip when I use the items I can recall fond memories of my trip.